Ice Is Nice – Dendritic Fractals Anyone? There is no escape. Nature is everywhere. 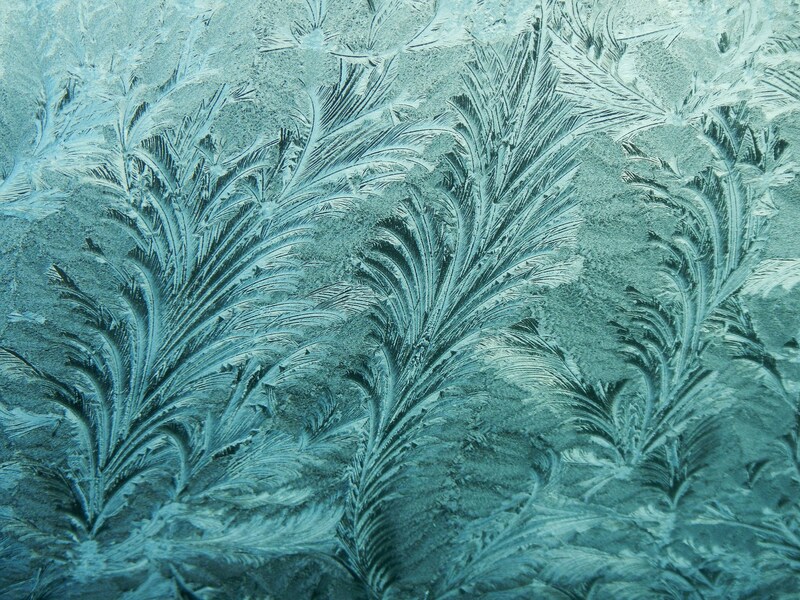 Even on a cold morning, its form can take shape on the window of your car. This time of year, which is also the beginning of a brand new one, (2014) nature expresses itself in the language of cold. Ice more specifically. Interestingly the architecture of nature’s design, so eloquently translated as the real art for which it is, is a marvelous sight to behold. How curious it is that a sense of order can been seen in nature’s randomness. That is, each particular shape is different individually, but design wise, similar collectively. Self-replicating, fundamentally. 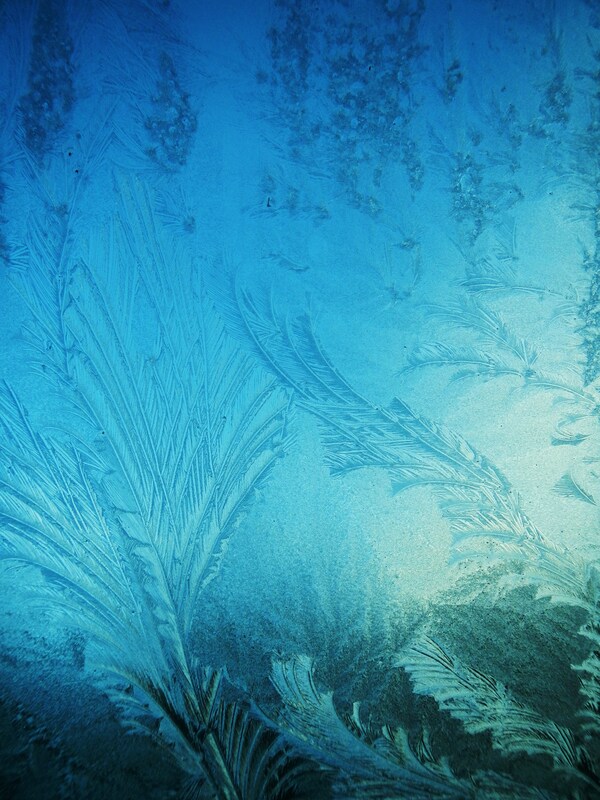 When ice forms on panes of glass, it is sometimes refered to as window frost, fern frost, or ice flowers. Some actually remind me of the symmetry seen of a large watershed when looked at from far above, like from an astronauts view point. All the rivers branch like limbs on a tree and similar to patterns seen in the intricacy of a feather. This dendritic pattern is a central theme of nature in many formative processes, and is sometimes referred to as a fractal. Such reoccurring patterns, seen from near or far, are a visible form of math, in terms of how shape and scale materialize. From bird feathers, geologic landscape formations, to ice crystals, nature has an orderly signature. Or at least, a very distinctive one, and easily recognized immediately for the hand that makes it. There are many types of snow and ice, all of which have certain characteristics common during the formation process. Snow crystals take the shape of a 6-sided dimension, similar to lava that also solidifies into columnar basalt matrix with the same number of sides. 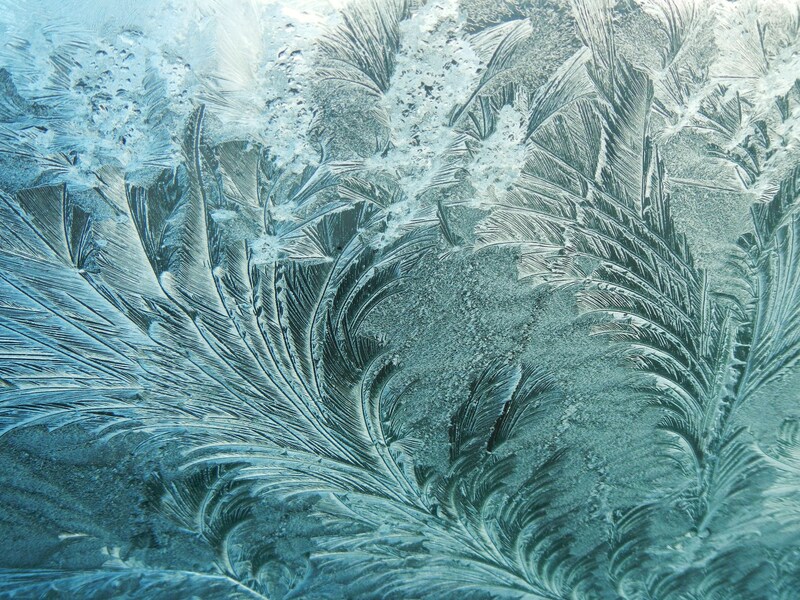 Yet, ice crystals take shape into a more dendritic fractal form. Dendritic simply means a multi-branching tree like form, while fractal refers to a mathematical pattern that is common to much of the structure throughout nature. But why the different number of sides or patterns that give rise to each creation, and what mechanism causes them? Hard to answer with variables stacked on top of variables that can affect the causation of such magnificent architecture. Despite whatever explanation might describe why, the essence is Nature’s signature seems to indicate math as the main language for communicating the spirit of anything and everything that moves through nothing and all things. While all this descriptive ice nomenclature that provides us humans the words to communicate beauty in nature is fascinating, its formulation is still always a number’s game. But beyond that, a more pragmatic question – why is ice slippery? I’m going to let that one slide by for now and go ice skating. Oars not needed. We enter and exit the world alone. It is all the time in-between, while we experience it, that affects how much joy we have from the perception of our place in the everyday world. Alone and aloneness are not the same thing. If we become attached too much to others or things to make us feel happy (psychologists call this “object referral,”) then without those stimulants we will feel distressed, depressed, and/or unhappy. An important human goal is to become content when you spend time with only yourself. Another rule of nature also applies when in pursuit of this basic goal: use it or lose it. If you wish to be happy more than sad or lonely, practice being content with the only one you are really with 24/7 as that person will always be your shadow. So not to worry. It Is ok to talk to yourself. After all, we do it all the time anyway, so it is more important to evaluate what we say to ourselves, than trying to hide our self-talk from others. So what do we need for purity of thought to hear only ourselves and not be bombarded by other voices and sounds that dilute our thinking? Solitude, is the simple answer. It is the fundamental place where we can exercise our ability in coping with ourselves. Anywhere you can go to be totally alone, without the distractions of other people, is getting harder to find these days. Thus, it is even more important to find where only your voice can be heard, and your mind free of chatter and clutter of other humans. Solitude allows us to practice enjoying life experience in a more purified form. unsanitized, undiluted, unadulterated, untechnologicalized, and back to basics. Cell phones and any computerized technology when used to extremes turn us into conditioned zombies. We lose ourselves to become the machines that dominate our lives. If you find yourself foaming at the mouth when you can’t find your phone, or the internet it down, or being digitally dis-connected to someone or some thing has been shut down, then you are most likely addicted to technology. Recent studies show that a big problem with always being hooked up to our high-tech gadgets is that our attention is divided between the world of the people we are with and this other reality – the place of digital connections that only simulate being plugged in to others. As we walk the streets with our head down, absorbed by tiny screens and buttons, the human next to us is not on our radar, despite being only inches away. Why do we favor such connections, or dis-connections? Could it be akin to comparing life in the city where people can hide in the crowd, while people in small towns know everyone else’s business and can’t escape the gossipy grapevine? Privacy is a valuable thing. In our digital world, everyone, town or city, can hide from real world interactions. We can be free to say things we wouldn’t say normally face to face. The conversation is changed when we use technology to communicate. People won’t invest much in a conversation when knowing that at any moment the person you are talking with will be interrupted by someone else trying to connect with you by the intrusion of that cell phone ringer. Thus, our communications with people become more surface, and less depth where more of the meaning of what our human being-ness resides. And if we continue to ignore our own inner depths, loneliness will creep into dominating our life and therefore impact negatively our real happiness. What is the answer to this dilemma? How about a place to find some solitude for a remedy to being disconnected. Connecting back to self, will help you appreciate the world and be content being alone, for in reality you are never really all alone. In nature, many things will talk to you if you take the time to tune in and listen. The burbling, gurgling streams, the chirp and chatter of otter, eagle and chipmunk, just to name a few. Solitude in nature is where nature speaks loudest. 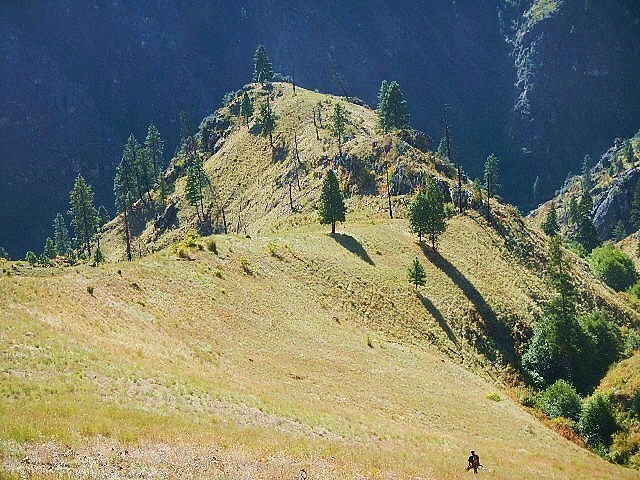 Being solo in the wilds allows a person to hear what was intended for humans to contemplate without distraction. Birth and death are natural, but in-between we get bombarded with many distractions to keep us from appreciating the value of nature and why we are here. What is more important, the illusion of being connected to everything by our contraptions, or the reality of being truly connected by how nature connects us without such high technology? No telephones, just a call from the wilderness. Will you answer it? Or make your own call, and contact the Wapiti Clan at 208:628-3523 and we will deliver you unto solitude. Like water, oil runs uphill towards money and not far behind it is rude and crude corporatocracy on the chase at all costs. No obstacle seems too large for big oil’s search for the black gold. No rules too big to break, as megaloads push north for the Canadian Tar Sands along Idaho’s beautiful Clearwater & Lochsa River waterway. 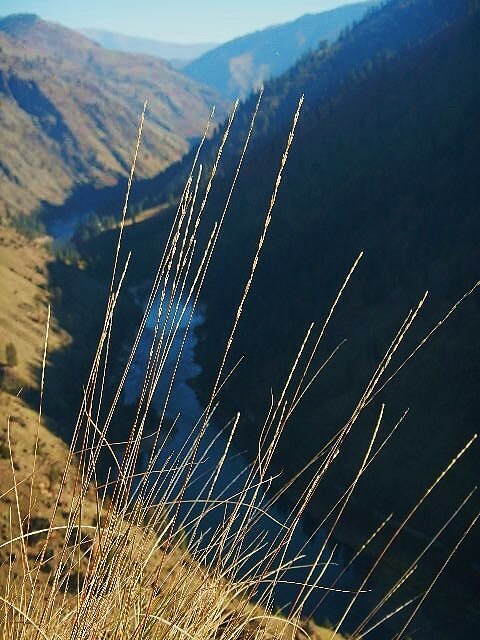 How quick the loss of memory about how the Nez Perce befriended and helped Lewis & Clark down this magnificent drainage in 1805 on the old Nez Perce trail. 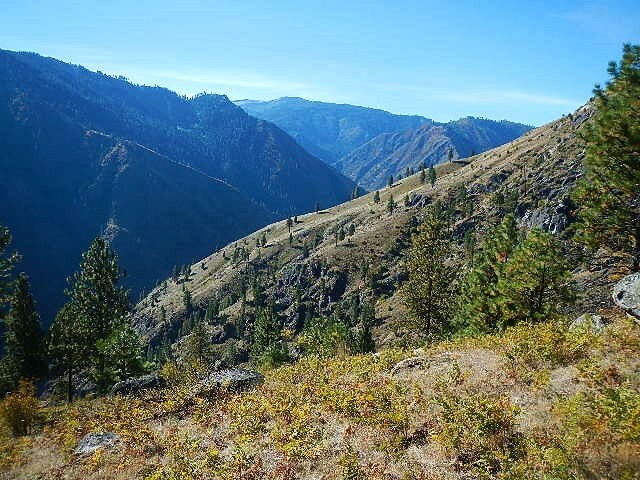 Yet today, that same trail, now Highway 12 through reservation lands is taken for granted by conglomerated giants of industry for access to the new pot of gold, regardless of the needs and interests of the Nez Perce people. This same avarice was the motivation behind early gold miners quick to trespass into Nez Perce lands after being supposedly protected by the 1855 Treaty. It is no mystery why land and boundary disputes soon arose and morphed into new treaty negotiations with aboriginals in an attempt to reduce the size of Nez Perce reservation lands. This led eight years later to the 1863 treaty that was not a fair transaction from the get go and eventually escalated to the epic saga of Chief Joseph and the War of 1877. Not much seems to have changed over the years. 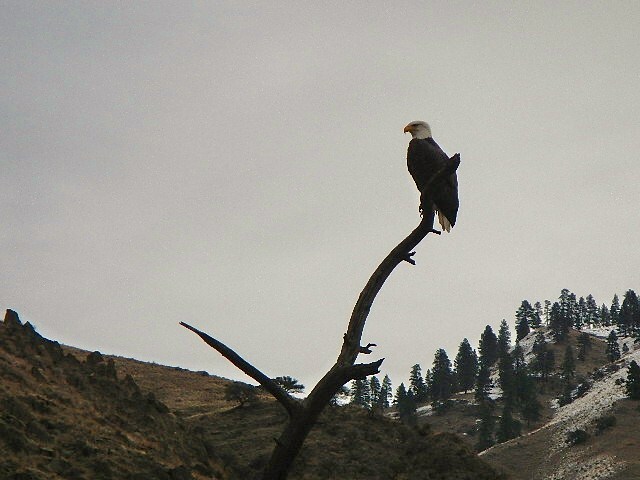 Now, in 2013 The take-over of Highway 12 by Corporatocracy is akin to the 1863 Steal Treaty, as certain historians and Nimiipuu people refer to it, when the US Gov’t grabbed Nez Perce lands by the standard instrument (treaty) used to fulcrum title to native lands. Our republic’s legacy of breached treaties and repeated betrayals is the nefarious way the west was won. Early European sprawl used the doctrine of Manifest Destiny and god sanctioned dominion over native people and the natural world, as the Christian justification for spreading roots and usurping control. So in a country gained by lawlessness and coercion, yet brags about being a democracy, while also having a double system of justice, one for the elites and one for the commoner, what else would one expect in a land consumed by such historic hypocrisy, unbalanced disparity, and ruthless genocide? The latest push by the megaloads up Highway 12, in ignorance of consultation with federal and domestic sovereigns, is yet another example of running rough-shod over communities of people with the industrial nose stuck high in the sky and snorting into the air the snot of arrogance and superiority. 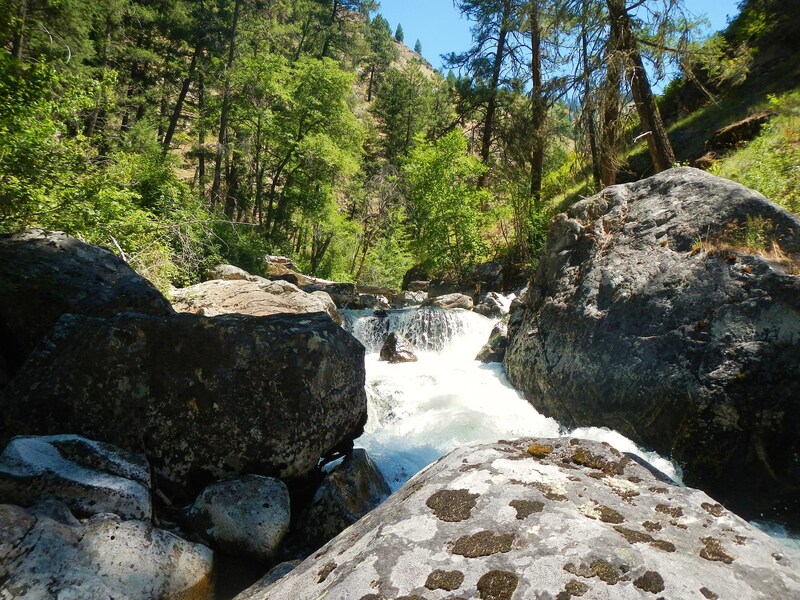 To claim that a river corridor has enough beauty to give it wild and scenic status, then treat it as if an ugly step sister, is like giving someone a gun for protection, but not giving them any bullets. What use are designations, if rules used to established and protect these values are ignored and not enforced? Part of the reason the white man gained an early reputation of having a forked tongue, is that they often failed to walk their talk. 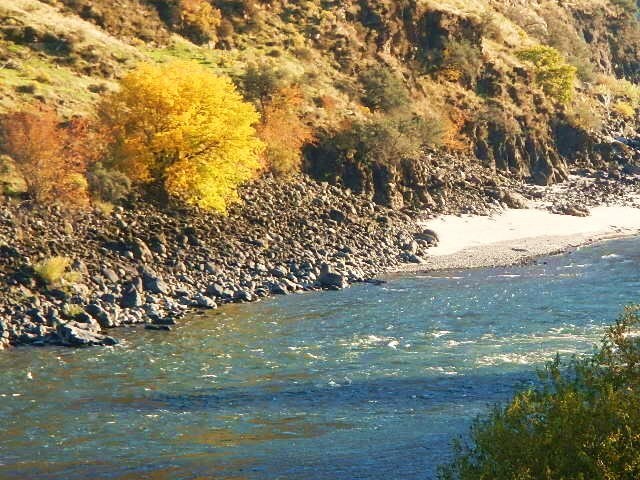 In an anti-federal state like Idaho, our leaders like to stir the states rights and privatization pot with a forked stick to match their tongues when it comes to scientific truths about natural resources and land use practices, along with their inept social integrity and dishonor in dealing with treaty obligations. Responsible negotiations with Domestic Sovereigns? What be that? Scorched Earth and Acculturation is still alive and well in Idaho. Only now, authoritative policies circumscribe an even larger circle of people, trying to herd them into the center for better control, often by questionable and illegal means. With a world view of dominion over nature, our culture sets about trying to control nature, but ends up mostly breaking down and fragmenting various ecological niches, which then requires looking for alternative ways to fix them. From endangered salmon to greenhouse gases and extreme carbon footprints, if lessons could ever be learned from history and native cultures world view to co-exist within a more harmonic framework of community-connections to all nature, instead of totalitarian attitudes about keeping it controlled and reined in for selfish gain, the world would be a better place for it. But, elites have a good way of convincing the commoners that they have their best interest at heart, yet are mostly out of touch with reality of ground truths pertaining to the natural economy and ultimate carrying capacities. They revel in their personal privilege while simultaneously escaping responsibility for exhausting and polluting most natural resources in the process of accumulating exponential wealth. This drives the compound interest of environmental degradation debt ever skyward and closer yet to the edge of no-return. (the humpty dumpty effect – as proven over and over again by many great societies of the past). Once broken, it is difficult to put back together again, and on a finite planet you can’t just always expect to find good solutions over the next hill, because it may be the last one. Small changes happening incrementally may give the false impression little things don’t matter. But collectively, through time, all grass eventually turns to brown, though it happens too slow to see until it all finally makes the transformation. The Roundness of Ice and Absurdity of Irony. Well, ice is nice, but sun is fun, and spring is beginning to fill my mind. However, before winter fades totally from the carnival of natural events during this time of year, some thoughts about ice still keep re-circulating here. Why? It is all quite amazing. 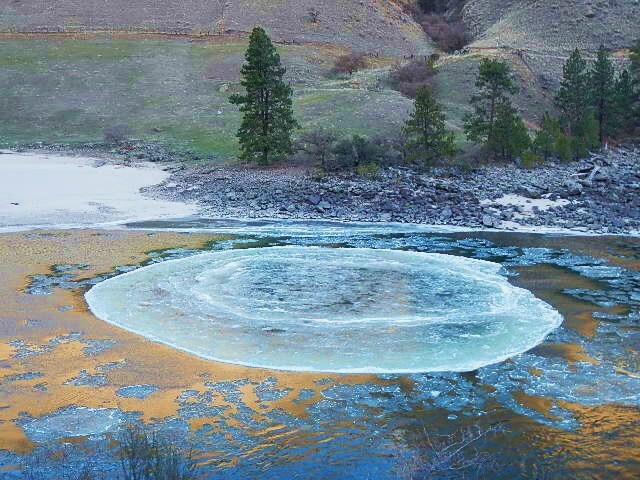 One of our previous river guests found the above picture of an ice circle on Planet Earth Phenomenon Facebook page. 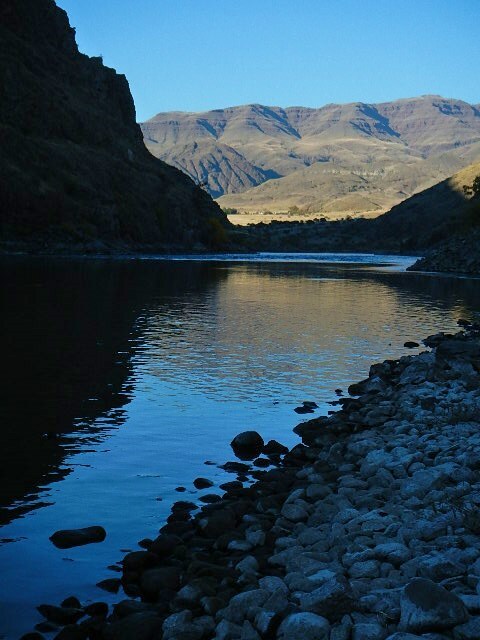 He then posted it on our FB page with the following comment: “This is a pretty cool picture of a Idaho river I am sure Gary could take anyone to it.” Little did he know, I was the person who actually took this picture. Then my wife, Barb, tracked down the photo on Planet Earth Phenomenon and noticed someone else had taken credit for it, though probably not intentionally, (truth gets distorted easily ). So she went about the task of attempting to set the record straight. After all, we do take pictures to share, but would at least like credit for it. Once informed, PEP then corrected the misinformation. Following their change, another guy whom had been trying for about 5 days to track down the true origin of that picture, rippled yet another set of motions. He went on a mission to contact us to see if we were indeed the people responsible for taking that picture, because he wanted to know the story behind it all. But, when he called, we were upriver. I was fly fishing for steelhead while Barb was helping some other lady friends pick up garbage on the river (ya I know, typical man – but hey, historically I have spent many such similar days). However, when we got home, Barb found his message, so gave him a call. 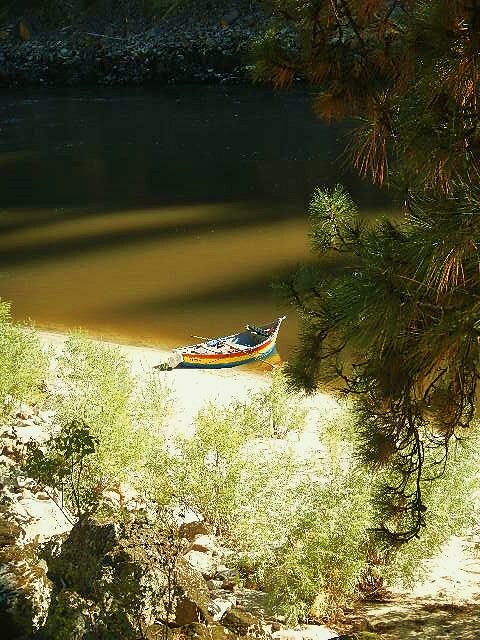 He told her his story and it ignited a series of several emails back and forth, where we soon learned we had many similarities in life styles, appreciation for rivers, and nature. Thus, the snowball grew. After all, “it only takes one rock to start an avalanche. This is also when we learned this photo had been going viral, which also led to our discovery that when we googled “ice circle” our photo came up everywhere on a ton of other sites. Little did we know the power of our own reach. It also led me into a giant loop of feedback in memory. Many past events of my various encounters of ice related situations began playing around in my head. An ice circle, more technically called pancake ice, thus created quite a stir. 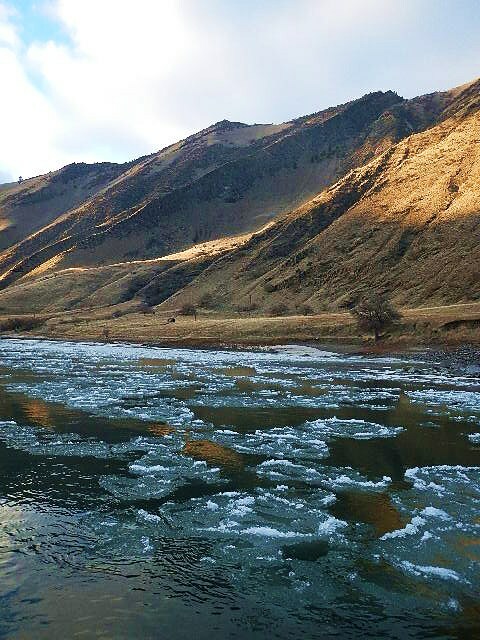 It sent my thoughts far back to times when I floated the Grande Ronde in the middle of winter, when I had to pull my raft across several ice bridges. Quite terrifying at first, but I learned how to read ice, like reading rivers, which helped me know how to deal with a host of unusual conditions more reasonably. But, it also increased my awareness for how to access areas most people don’t, and to see things most people won’t, because of their fears. It catapulted my appreciation for barriers. They are like walls to keep at bay those things that make solitude hard to find. I soon learned that the “offbeat”, (climbing over or around barriers) is a great dance step. May not look pretty on the dance floor, but what a fun dance it makes to put your toes into wonderful places without worrying about getting stepped on. Not being afraid to look or be different and to go against the common flow of things has great rewards. 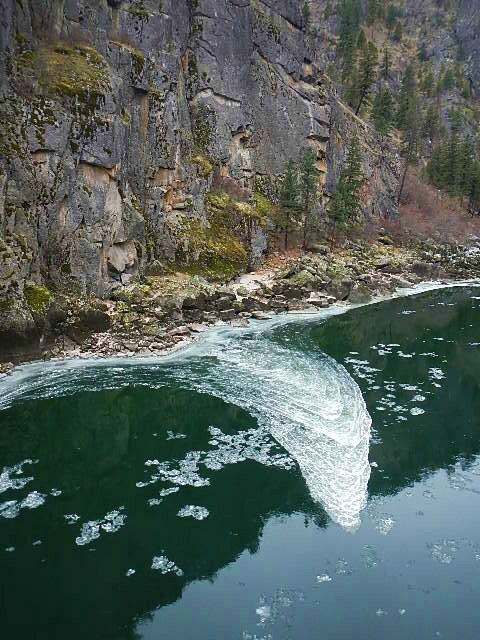 Like seeing deer grazing under giant frozen waterfalls, elk swimming across a river to gain more food on southern exposures, bald eagles cruising for prey weakened from harsh weather, and water ouzles (dippers) playing amidst it all – taking underwater dips in all that coldness. Note: as I was writing this post, yet another writer/photographer from a paper in Montana contacted us to get the back story to our picture. Again, seems quite amazing. On the surface it all seems like such a random thing. But diving underneath it all, like the dipper, another world exists, along with new revelations. Sometimes random, is not as random as one first thinks. ( absurdity of irony). In nature, there are power laws that rule which serve to bring order out of chaos. (more fodder for another post down the line). For those of us who live so close to the river, it seems the river talks to us in its own language. It doesn’t use words to speak to us, but events that communicate to us, all the same. Such is all natures language, and the best story ever told, for those who choose to look and listen. And this time of year the river reveals a message written in the beauty of what colder weather has to offer. 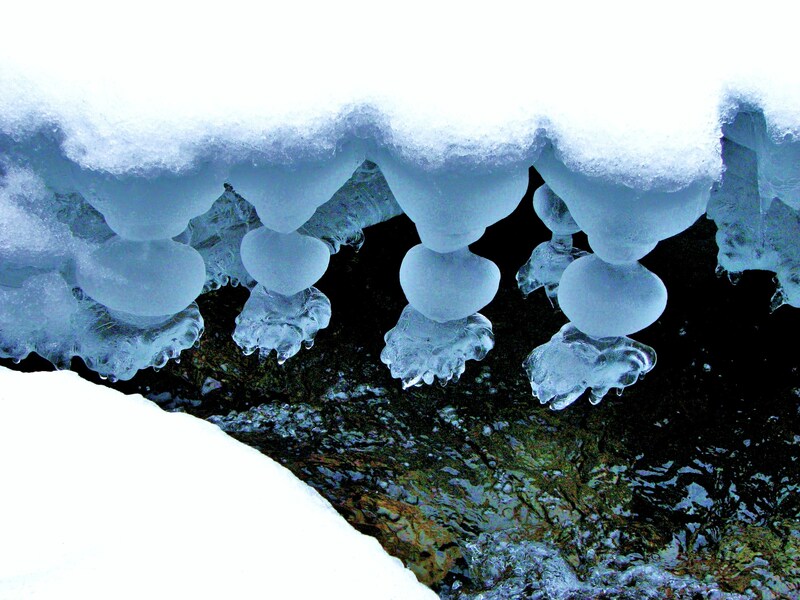 When air temps get cold enough to freeze water, ice begins to form in variable patterns and dimensions. Eskimos and people who live with natures extremes have developed acute appreciation of this natural communication with the elements. They have advanced knowledge and have come to recognize many forms and meaning of ice and snow, that those who live removed from such events, have lost or never had. Each condition of a snow flake or ice crystal can mean different things. Survival depends on such recognitions, to know when it is safe to travel or not over rivers during winter months. Wish I had possession of such knowledge, but don’t. But I do have appreciation for at least some simple events the river throws our way this time of year. A couple of things, come to mind, anchor ice and rosettes. 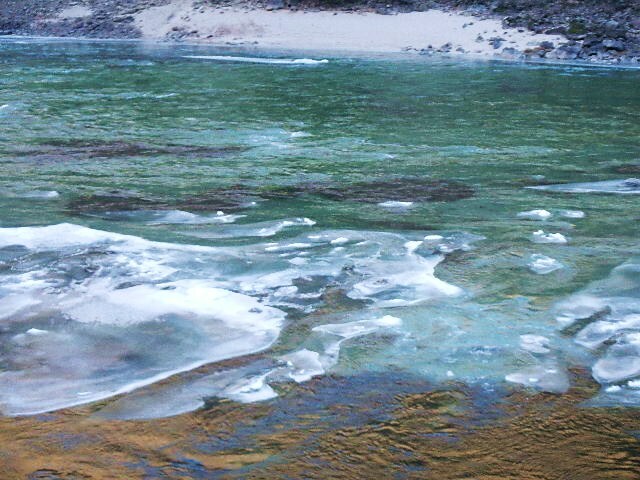 Some of the shallow shoals of the river bed get ice forming on the very bottom of the river, before ever freezing over the top of it. Why? Naturally, it is colder in those areas in order to freeze, but why there, and not somewhere else of similar dimensions? Amount of shade in those areas? Hard to know, but interesting to see. 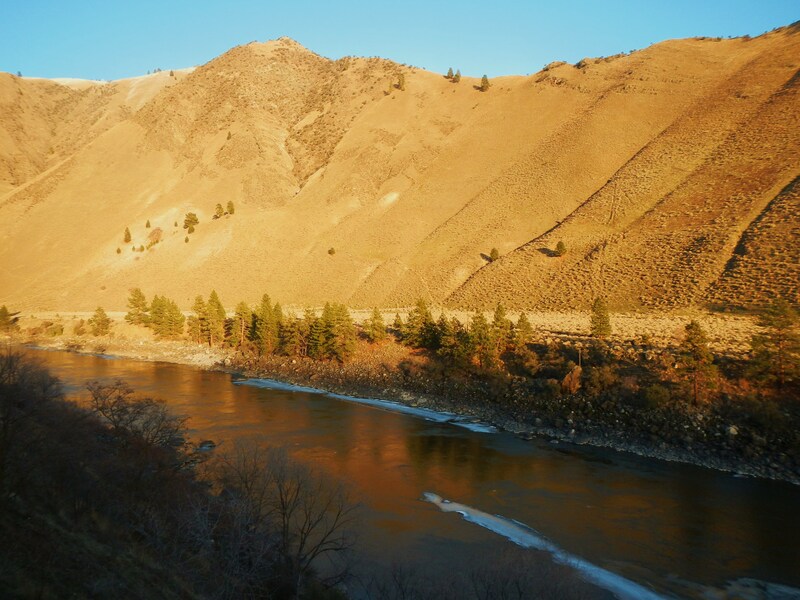 The Salmon River drains a huge expanse of geology and therefore is a big river, in itself. 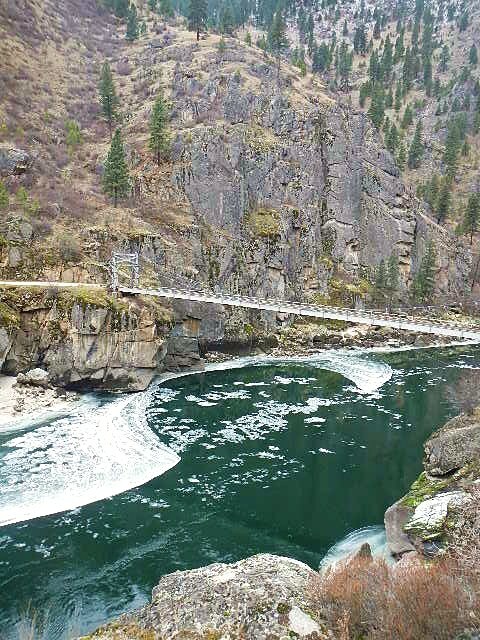 That means lots of pools, in this pool and drop type river, that are 50-60 feet deep in many places. So only the few areas that are less than 5 feet deep, in the form of shoals and tail-outs, get the anchor ice. 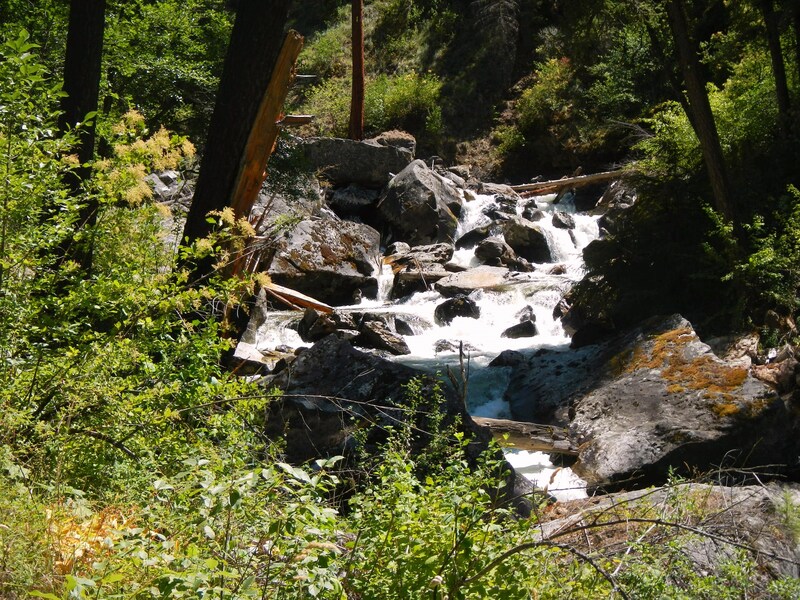 Although, the deeper sections between rapids sometimes freeze over entirely, with rapids getting travertine like formations that dam up water into bowl like fountains to make wonderful eye candy. In the bigger eddies with the right morphology, ice rosettes form. These are round islands of ice that are formed and trapped by the eddy that has created it. 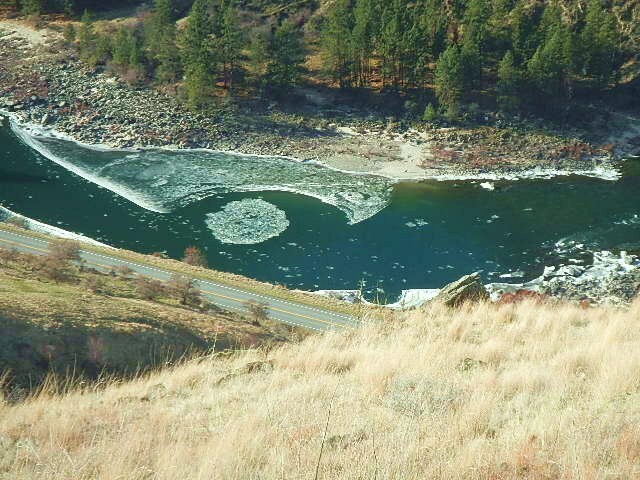 Normally, ice fingers extending out from various shorelines serve as barriers to capture downstream chunks of ice as they float downriver. These chunks then get caught in the middle of the eddy, and collectively get larger as more ice joins the slow spinning circle. 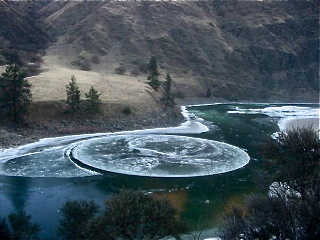 Eventually the round motion causes a round circle of ice that gets so big that it barely remains separated by surrounding shoreline or mainstream ice blankets. Of course, sometimes the rosette joins at the edges and disappears as it becomes one with the entire blanket of ice created by extreme conditions that last for a longer time spell. So it is at the edges, of formation or melting that ice rosettes appear or disappear. It takes a mix of spin and cold to keep them alive as rosettes and the natural event that speaks to us in the winter. Thank you river. 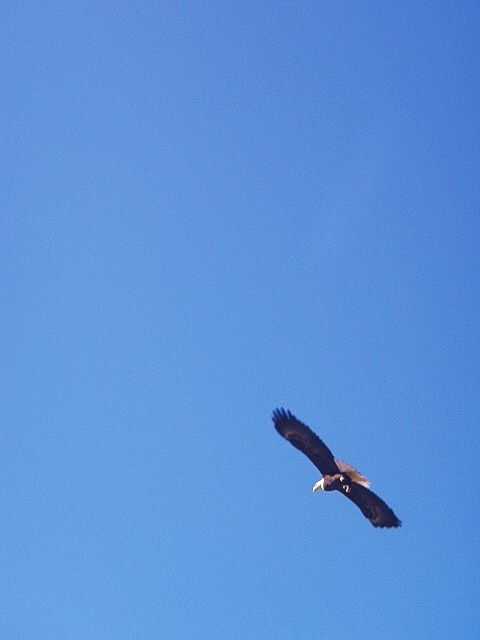 What Will Be Your Round Dance With Nature In 2013? As another year comes and goes, I am reminded yet again of the round dance in nature and the circular character of most everything we come to face with every day. You are as much at the center of the universe as anyone else is, due to the idea that the center of the cosmos is everywhere. Yet you are unique, too, just like everyone else, as paradoxical may it be. Some people will reflect back on the year gone past, and perhaps make new resolutions for the next full revolution our earth makes around the sun. Our own human behavior seems to mimic that cyclic and circular way of nature. 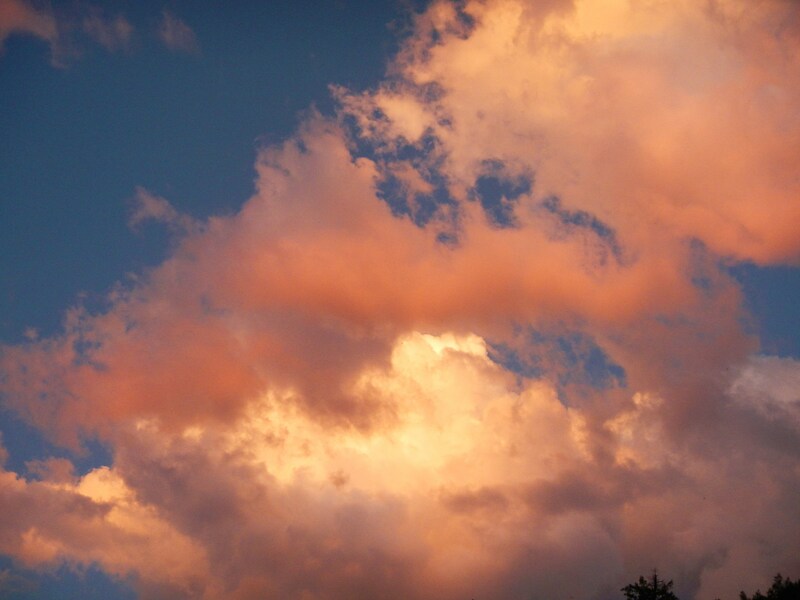 The sun, moon, stars, all seem to dance across the heavens in a circular path going around us every day. Up and down, around, all heavenly bodies move under the illusion created by our earth, itself spinning around in a circle about an invisible axis. Even the seasons are brought about by various positions of earth and the direction of tilt in its axis (i.e.- pointing toward the sun for summer, away from for winter). Bird nests are round, eggs nearly so; birds are born, they die; successive generations carry on the same tradition over and over again. Rivers run to the ocean, rain comes back to replenish the mountains and future run off. Predator-prey relationships merry-go-round in ups and downs in population numbers as each are affected by the other in a race for dominance. There seems to be no evidence in the universe for a final end to anything. Everything marches on, no beginning, no end. Matter cannot be created nor destroyed, say the physicists. All are one, say the philosophers. We are caught up in and endless walk upon our blue dot of a planet through a cosmic warpville. Human kind is always seeking truth through religion or science, or both, or neither. Through it all is power of place, where we receive our feelings of significance in an uncaring universe. For in our engagement with the landscape where all dancing takes place, is our connections to everything else, and ourselves. It is a round dance that spins meaning into our lives. After all, each place has a pattern and natural rhythm that sings forth its own song. It is a strong song to those who listen, really listen, and it affects even those who don’t listen. Heard or not, seen or not, the stone cast into the water makes a rippling wave both in sight and sound. Such is the dynamic of natures music. Everywhere we put our feet, from mountain top to river bottom, is our connection to that special power of place and Motherearth potency. It is where we can sing our own songs and deeply communicate with everything outside ourselves. 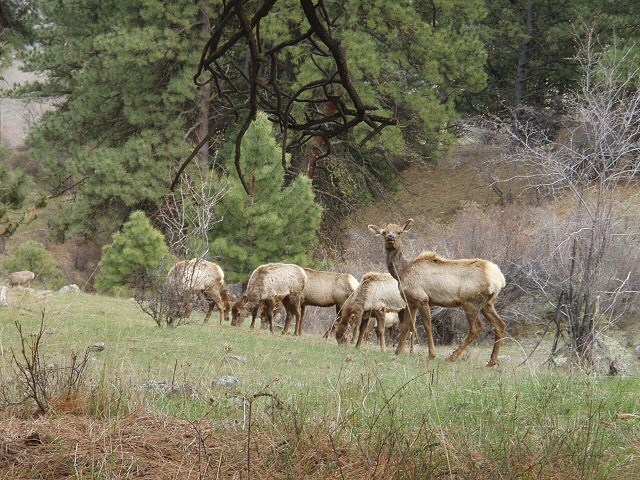 Every bush, rock, tree, bird, elk, fish, leaf, noise, wind, gurgle, chirp, has its own language. Even silence is the voice of the Great Mystery, say many of the primal people from time immemorial. Some times we see with our ears and hear with our eyes. All languages are different and can be interpreted in widely various ways, depending on how we perceive them. In reality, we are all primal in our human urges and have our own ways of communicating with the earth. Some are more harmful than others, and can become a self-inflicted wound as we round dance with our selves and forget about our partnering with nature. “What we do to the earth, we do to ourselves,” said Chief Seattle (or ghost writer, so some claim, though the message still rings true). So how we dance and carry on, is important for the human scale in earthly matters. We determine our own destiny through our human value system. Nature cares not what we do, as she always has the last dance. So my personal resolution for 2013 is to practice a lifestyle and dory dance with a softer imprint and try not to step too harshly on natures toes in the process. What kind of dance will you do?